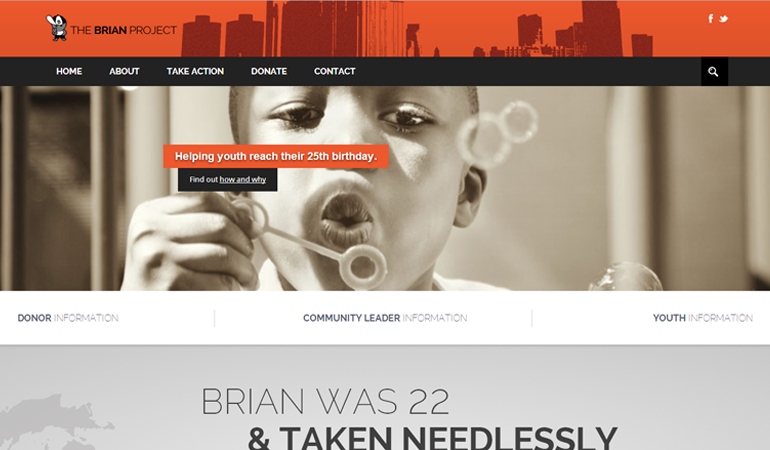 In honor of Brian Jones and the countless other victims of violence, the BRIAN Project equips youth with the tools they need to face hardships, to transform communities, and to end the epidemic of violence. On February 22, 2005, one day shy of his 23rd birthday, Brian Jones was murdered in Detroit. Brian loved basketball, listening to the violin, telling jokes and working with kids. He was generous and compassionate with others, always seeing the best in everyone. His strength was indomitable, but his spirit was tender and kind. He went through so much in his short life but never gave up, always smiled and always believed in the best. While his story is one of millions similar in the U.S. and worldwide, his death was not in vain. Brian’s life was taken that tragic night, but two were spared – Sara Hockett’s and their son Dante’s. Surviving this senseless violence, Sara and Dante began working through the disappointing maze of the legal system, hoping to find resolution and a measure of closure to the loss of their loved one. What they learned is that reacting to violence with grief and apathy would be frustrating and foolish. In 2006, Sara returned to her education, in pursuit of solutions to the problem of violence in her community and to help prevent other families from experiencing the same heart-wrenching pain she had. She obtained her Master’s Degree in Public Health from Michigan State University, with a focus on interpersonal violence, in 2012, and the dream of starting The Brian Project became a reality. In honor of Brian and the countless other victims of violence, our organization strives to avert these tragedies using an established, tested public health model. We must first understand the multiple contributors to violence, many of which are socioeconomic, before prevention can happen. Equipping youth and families with the knowledge and tools to face these hardships, we can face our national epidemic of violence head on. Old, reactive strategies to stem violence in our communities have proven ineffective. We believe new, proactive strategies must be employed to make real change.